Hughes Marino is San Diego’s premier commercial real estate firm that exclusively represents tenants and buyers — never landlords — so we never have a conflict of interest. We help companies lease, buy and build the facilities of their dreams, and we’ve been voted San Diego’s best commercial real estate company four years running. Our brokerage services come with a 100% guarantee, which means that if you’re not happy with your service then we will give you our commission. And unlike most commercial real estate companies in San Diego, our team is comprised of licensed real estate brokers, and not just salespeople. Let us put them to work for your organization and show you why the Hughes Marino experience will change the way you think about San Diego commercial real estate. San Diego’s largest commercial real estate firm exclusively representing tenants and buyers. Helping you build the perfect space to do business. We can save you money by identifying errors and overcharges in your lease. We assist companies with real estate requirements in cities across the country. The details of your real estate transaction are none of your competitor's business. We'll make sure they stay that way. Unlike most brokerage firms, we only represent tenants and buyers — never landlords — so we never have a conflict of interest. As a family owned business, we are committed to customer satisfaction, and we offer a 100% guarantee on our service and results. We employ licensed brokers, not just salespeople. And we've been voted San Diego's Best Commercial Real Estate firm every year since 2011. 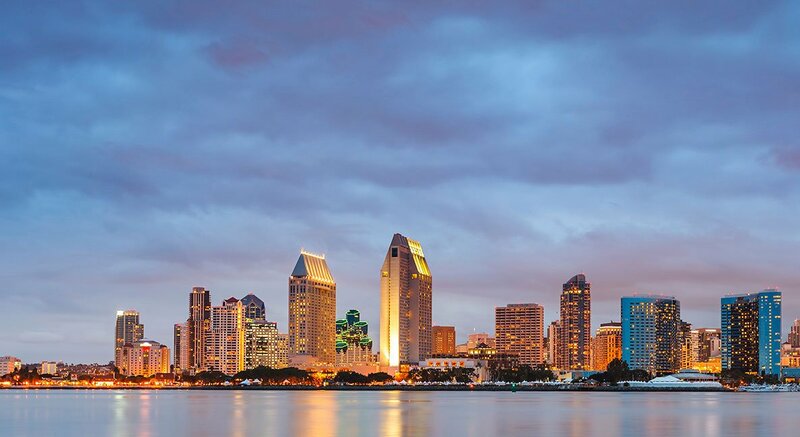 This first quarter of 2019 continued with a “ho-hum” reaction to the commercial real estate market in San Diego County, with one exception–the unprecedented recovery of both office and lab space in the UTC market. While total availability of all combined industrial, lab and office space countywide increased again slightly this last quarter, UTC alone had its availability rate literally cut in half from 16% at the end of 2018 to 8% at the end of the first quarter in 2019. Never before has a San Diego county office submarket improved so radically, so quickly, and broken away from the pack of all of the other submarkets. We believe if you represent both plaintiffs and defendants there’s an automatic conflict, whether it be real or perceived. So it only made sense to choose Hughes Marino, a company that represents tenants only, to handle our lease negotiations in San Diego, Los Angeles, San Francisco, Houston and New York. With over 150 lawyers and 275 support staff, we have very specific space and technology requirements and Hughes Marino has the expertise to manage our leasehold improvements. We’ve certainly benefited from their tenant-only focus and full range of services. They are tireless in their efforts. We have a long-term relationship with the Hughes Marino team that goes back 17 years. They’ve handled many projects for us, including our corporate headquarters in Carmel Valley, our San Diego Service Center in Kearny Mesa, and numerous branch locations throughout the county, including our main downtown office. They’re very professional, and they have good, solid market information. You’re not concerned that they’re also representing one of the landlords you are negotiating with because they only do tenant representation, which for us is important. I have worked with the Hughes Marino team for over ten years, their knowledge of the San Diego office space market is extraordinary. They know all the players, and because they do so many deals and because of their depth of understanding of the San Diego market, I think Hughes Marino is able to help every tenant get the best deal possible. We believe that it is our duty as a local business to give back to the community that nurtures us. That's why we are proud to support the many nonprofit organizations that make San Diego a great place to live and work.